December 12, 2017 – Ottawa, ON – The Canadian Food Inspection Agency (CFIA) is updating its national chronic wasting disease (CWD) program to better focus on disease prevention and risk management. A three-month extension to the implementation date has been granted to give producers, regional administrators and status assessors, provinces and territories more time to prepare for the upcoming change. Disease management is a shared responsibility. Efforts to eradicate CWD in the farmed cervid population have not been successful. As a result, the CFIA's new approach aims to reduce the risk of the disease spreading by encouraging producers to adopt strong risk mitigation measures. Enrolling in a Voluntary Herd Certification Program (VHCP) is important to help prevent the introduction of CWD to a farm. A VHCP requires enrolled producers to take measures to mitigate the risk of CWD, including ongoing surveillance testing of mature dead cervids and implementation of biosecurity measures. Starting April 1, 2018, the CFIA will only respond to and compensate producers enrolled in a VHCP. A transition period is being provided throughout 2018 to give producers time to enroll in and complete 12 months in a VHCP. Starting April 1, 2019, the CFIA will only respond to and compensate affected producers who have been enrolled in and compliant with a VHCP for at least 12 months. CFIA's response includes movement controls, ordering destruction and disposal of infected herds, and providing compensation to producers. More information about VHCPs is available in the Accredited Veterinarian's Manual, chapter 13. June 30, 2017: Announcement of program change to producers, associations and other affected organizations. April 1, 2018: New program starts. As of this date, producers need to be enrolled in a VHCP to be eligible for CFIA response and compensation. April 1, 2018 to March 31, 2019: During this transition period, producers should contact the regional administrator of the VHCP available in their area and consider enrolling in the program in order to control the risk of CWD entering their herd and to be eligible for federal response and compensation. April 1, 2019: Full implementation of program change. As of this date, only producers that have been enrolled in and compliant with a VHCP for at least 12 months will be eligible for the CFIA's full response and compensation. The Ministry of Agriculture had effective processes, for the 12-month period ending August 2017, to minimize the risk of occurrence and spread of diseases of farmed animals in Saskatchewan other than in the two areas noted below. To prevent and control the spread of diseases among farmed animals in Saskatchewan, the Ministry does the following. It maintains a list of 14 diseases it considers of sufficient threat to require provincial notification and monitoring. It carries out surveillance activities on almost one-half of its provincial notifiable diseases. In the event of positive cases of notifiable diseases, for three notifiable diseases, the Ministry has formal written plans to respond. For the remaining notifiable diseases, it monitors the sufficiency of actions taken to treat diseased animals, and actions taken to prevent further spread of the disease. Furthermore, the Ministry identifies new or emerging diseases, and has a documented plan to prevent foreign animal diseases from entering the province. It gives producers adequate information to educate them on disease risks, and disease prevention and control techniques. However, the Ministry did not maintain support for its decisions on which diseases to include on the list, which diseases warrant surveillance, or the extent of its involvement in reported cases of livestock diseases. While the Ministry maintains records on positive cases of notifiable livestock diseases to summarize key information about the case, its records are not complete. These records are the Ministry’s main monitoring tool to determine if veterinarians and those contracted by the Ministry took sufficient actions to limit the spread of disease. The livestock sector in Saskatchewan had average annual revenues around $2 billion for the last three years. Disease outbreaks can impose significant effects on production, price and value of livestock products. The total number of CWD cases detected in wild deer in Alberta since September 2005 is 592. In conjunction with the new hunting seasons, the 2017/18 CWD surveillance program is again underway. We began hunter surveillance in 1998 and have one of the best continuous datasets documenting the occurrence and patterns of CWD in wild cervids, and specifically in prairie/parkland ecosystems. The continued support of hunters and landowners over the previous 19 years is the basis for the strength in the surveillance data. For 2017/18 the basic program remains much the same as in recent years. The mandatory area for submitting deer heads expanded to include (WMUs 206, 208, 228, 240, 242) in association with an infected deer detected in WMU 242 in 2015/16. In addition, we added new WMUs of Special Concern (250, 252, 260) in response to a case identified in WMU 250 late last year. Additional deer heads from the units of Special Concern will provide perspective for the outlier case and these WMUs will be included in the mandatory area next fall. We also expanded the number of 24hr freezers, including freezers at Brooks, Morinville, and Smoky Lake. And the freezer in Drumheller was moved to a new location. Visit our web page below for a link to a map of all of the WMUs that are Mandatory or Special Concern, as well as the complete list, addresses, and a map showing locations of all the freezers available during the rifle seasons. Note that the head drop-off freezers are ONLY available from mid October to mid December. However, any time throughout the year, heads can be submitted at any Fish and Wildlife office during their office hours. See page 13 of the 2017 Alberta Guide to Hunting Regulations for office locations and phone numbers. Please also note that for biosafety and logistical reasons, we are unable to return heads to a hunter. If you wish to keep any part of the head or antlers, you should remove it before submitting the remaining portion for CWD testing. Additional information is provided at the web page below. The success of the CWD surveillance program relies heavily on participation by hunters, guides, and landowners to ensure a successful harvest that provides heads to be tested. We gratefully acknowledge the efforts of one and all. Note that hunters receive NEGATIVE test results directly at the email address associated with their individual AlbertaRELM account. The email process is the only notification hunters receive when their animal is NEGATIVE for CWD. As in the past, hunters who harvest a CWD POSITIVE deer are contacted directly by phone (see below). There are significant overall patterns of disease occurrence in Alberta. CWD continues to occur primarily in mule deer in comparison to white-tailed deer despite testing large numbers of both species. Similarly males are more likely to be infected than females. Thus male mule deer are the most likely, and female white-tailed deer the least likely to be infected with CWD. The geographic distribution of CWD is clustered in some WMUs but continues to expand westward. The finding of CWD in a moose near the South Saskatchewan River valley in 2012 is the first such case identified in Canada. The CWD Freezer Locations currently posted on the Information for Hunters page has all the correct information for 2016. Note that the freezers generally are available each year only between mid-October and late December. Current information also is available from any Fish and Wildlife office. In 2016/17 we tested a total of 5112 heads and detected CWD in 179 animals (3.5%; up from 2.4% in 2015/16). The positives included 178 deer (154 mule deer, 23 white-tail, 1 unknown deer; 136 males, 41 females, 1 unknown gender) and 1 male elk. As in previous years the majority of cases were mule deer (154 of 179; 86%), particularly mule deer bucks (119 of 179; 66%). The disease continues to expand further westward into central Alberta. In the 2016/17 surveillance sample, CWD was again detected beyond the known range in the province (further up the Red Deer River in Wildlife Management Unit (WMU) 158, in WMU 230 in the Battle River watershed, and in WMU 254 in the Vermilion River watershed). These units are adjacent to previous cases and indicate further geographic spread of CWD along major waterways. However, the finding of CWD in a white-tailed deer in WMU 250 northeast of Fort Saskatchewan is a significant westward extension of the known occurrence in the North Saskatchewan River watershed. We also detected CWD in a bull elk from WMU 732 (Canadian Forces Base Suffield). Since 2012, we tested 1973 elk from WMU 732 and this is the first one found to have CWD (0.05%). However, the disease is well established in mule deer and white-tailed deer in areas outside the military base along the Red Deer and South Saskatchewan rivers. Hunters continue to support the program and are providing a solid foundation on which we can monitor CWD as it spreads among eastcentral deer populations. Submit deer heads for CWD testing at any Fish and Wildlife office during their office hours or any of the forty-nine 24-hour freezers in Edmonton, Calgary, and across eastern Alberta during rifle seasons. Submission of deer heads for CWD testing is MANDATORY in eastern Alberta from Cold Lake south to the US border. CWD has not been identified in any BC sample to date, but continued surveillance is required to have confidence in our CWD free status. The B.C. Chronic Wasting Disease (CWD) Program is led by the Wildlife Health Program and supported by a wide group of agencies and BC residents who are concerned about this important disease. Surveillance continues in response to new positive cases in deer, elk and moose in Alberta. The Program focuses on prevention, surveillance and outreach to ensure that CWD does not become a problem for deer species in B.C. 2016 Results are in: NO POSITIVES! Since 2002 we have tested 3442 cervid (deer species) heads for CWD. These heads include hunter harvests, road killed and clinical suspect animals. CWD has not been identified in any BC sample to date, but continued surveillance is required to have confidence in our CWD free status. Be Aware of the Risks If you hunt in areas where CWD affects wild deer, do not bring high risk tissues back to B.C. Infected animals or tissues can contaminate soil and infect BC wildlife. CWD has not been detected in Manitoba. This information, "Chronic Wasting Disease - A Threat to Manitoba's Wildlife" (208kb), is available online as a PDF document. A French version (142kb) is also available. Chronic wasting disease (CWD) is a fatal disease of the central nervous system of deer and elk. This disease belongs to a group of diseases called transmissible spongiform encephalopathies (TSEs). TSEs tend to be species specific and most are not believed by scientists to be naturally transmissible between different species. CWD has not been detected in Manitoba. To date, more than 2,300 deer and 1,400 elk have been tested and all have tested negative. Creutzfeldt-Jakob Disease (CJD), a human disease found worldwide. CWD is caused by an accumulation of abnormal proteins called prions, which causes degeneration of the brain cells. As the cells die, holes are created in the tissue, giving the brain a spongy-like appearance under a microscope. Once the disease has progressed, brain function is impaired with resulting changes in the animal’s behaviour. Infected deer and elk show abnormal behaviour accompanied by progressive weight loss. In later stages of the disease, affected animals show signs of extreme weight loss, repetitive behaviour, drowsiness, lack of coordination, drooping head and ears, drooling, and increased drinking and urination. There is no known case of a human being infected with CWD. Research suggests that this disease is not naturally transmissible to humans, pets or other domestic livestock. The exact method of transmission has not been identified. Evidence suggests that the disease can pass from animal to animal by direct contact or through contamination of feed, soil, and water sources with saliva, urine and/or faeces from infected animals. Currently, there is no approved live animal test for CWD. Diagnosis is made by microscopic examination of the brain and other tissues from dead animals. Although progress has been made in understanding the disease, much is still unknown and active research is continuing. It is best to be cautious concerning which species can get CWD until there is conclusive information. CWD has not been found in Manitoba, however, it has been detected in many areas of North America and in Korea. CWD was first identified in the late 1960’s in captive deer research herds in Colorado and Wyoming. In the early 1980’s, it was detected in free-ranging deer and elk in northeastern Colorado and southeastern Wyoming. It has since been found in farmed deer or elk herds in Saskatchewan, Alberta, Colorado, Wyoming, Montana, Kansas, Nebraska, South Dakota, New York, Minnesota, Oklahoma, Wisconsin, and Korea. CWD has also been detected in free-ranging deer or elk in Colorado, Wyoming, Illinois, Utah, New Mexico, Wisconsin, South Dakota, New York, Nebraska and Saskatchewan. The World Health Organization (WHO) has stated that, based on its review of the science, there is currently no evidence to indicate that CWD can affect humans. However, the WHO recommends that all products from animals known to be infected with any prion disease should not be consumed. In Manitoba, harvested deer and elk are safe to consume. There is no evidence of CWD in Manitoba, the disease has not been detected in farmed elk, or wild deer or elk. Over 1,400 elk and 2,300 deer from the Riding Mountain and Duck Mountain areas and the southern part of the province have been tested for CWD - all tested negative. If you observe an animal that appears to be sick, do not shoot the animal. Note the precise location and contact the nearest Manitoba Conservation and Water Stewardship office. Manitoba Conservation will collect and test any wild deer or elk that appears sick and is exhibiting signs of being infected with CWD. If you kill a deer or elk that is unhealthy and extremely thin do not field dress the animal. Attach the game tag and contact the nearest Manitoba Conservation and Water Stewardship office. Hunters who surrender a diseased or abnormal animal will be eligible for a replacement licence at no charge. Manitoba Conservation is working cooperatively with other jurisdictions regarding the prevention, containment and eradication initiatives of chronic wasting disease. There’s no evidence the disease is in Ontario, but it’s important to be vigilant. It would harm wildlife and the economy. Testing for 2016 is complete; all test results were negative for CWD. The Ministry of Natural Resources and Forestry conducts an annual surveillance program for chronic wasting disease testing in deer. This year, scientists will be testing deer harvested in Wildlife Management Units 64A, 64B, 65, 66A, 66B, 67, 69A-2, 69A-3, and 69B. dropping off your deer's head at a Ministry of Natural Resources and Forestry freezer within a few days of harvest. Currently, the Department has no indication that the CWD can be present in Quebec. It is essential to quickly detect the introduction of CWD in Quebec in order to increase the possibilities of eliminating the disease and limit its spread, while reducing the costs associated with these interventions. 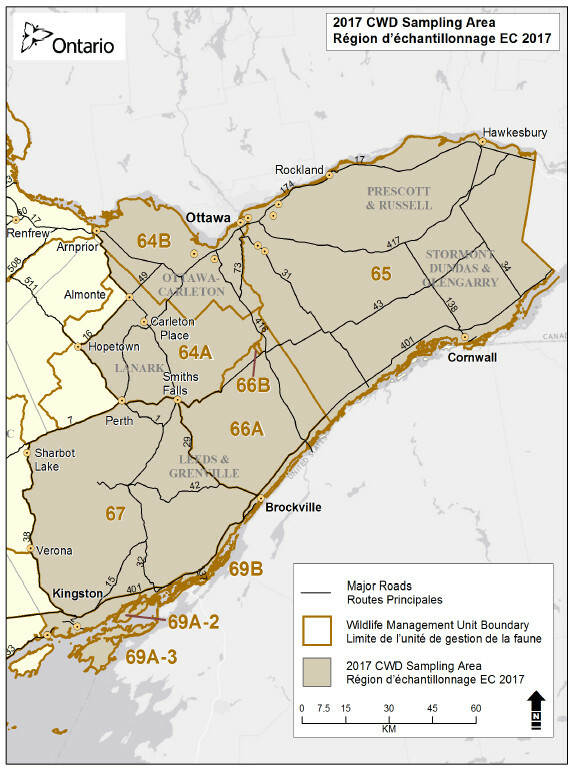 Since 2007, the Department, in collaboration with the Quebec Ministry of Agriculture, Fisheries and Food, has been conducting a wild deer monitoring program in the sectors most at risk for the introduction of CWD. , in the extreme south of Quebec. In the past 10 years, more than 8,200 deer have been analyzed, and no cases of CWD have been detected. Number of white-tailed deer analyzed for chronic debilitating disease (CWD) in southern Quebec from October 2007 to December 2016. Originally, the program was primarily based on the collection and analysis of white-tailed deer in a road accident, but since 2013, the vast majority of animals analyzed for CWD have been deer killed at the time of the accident. hunting, particularly in the Estrie and Montérégie regions. In the rest of the province, the risk of introduction is considered lower. As a result, surveillance is less intensive. The specimens analyzed are mainly cervids showing clinical signs that may be associated with CWD. Although small in number, they are a priority for sampling since this category of specimens is more likely to be infected with CWD. Testing from 2001-2017 shows that the Yukon has disease free herds. The Yukon Agriculture branch works with the federal government, other Yukon government departments and industry to monitor animal and plant diseases. CWD is a progressive, fatal, degenerative disease of the brain affecting cervids (elk, mule deer, reindeer and white-tailed deer). It belongs to a group of related diseases called Transmissible Spongiform Encephalopathies (TSE's), which include Scrapie in sheep and goats, Bovine Spongiform Encephalopathy (BSE) in cattle and Creutzfeldt-Jakob Disease (CJD) in humans. CWD is not the same as BSE. TSE's are caused by abnormal proteins, called prions, which accumulate in the brain. There is currently no treatment or vaccine available. In order to determine if an animal is CWD free, testing must be done post-mortem. Learn more about preventing CWD in this fact sheet 544 KB. To monitor CWD in Yukon cervids the Yukon government implemented a Mandatory Chronic Wasting Disease Surveillance Program 231 KB and a Voluntary Chronic Wasting Disease Certification Program in 2003*. Canada, U.S. agree on animal-disease measures to protect trade, while reducing human and animal health protection. Canadian veterinarian fined after approving banned BSE high risk cattle for export to U.S.A.
Alberta dairy cow found with mad cow disease. TRANSMISSIBLE SPONGIFORM ENCEPHALOPATHY REPORT UPDATE CANADA FEBRUARY 2011 and how to hide mad cow disease in Canada Current as of: 2011-01-31. Manitoba veterinarian has been fined $10,000 for falsifying certification documents for U.S. bound cattle and what about mad cow disease? REPORT ON THE INVESTIGATION OF THE SEVENTEENTH CASE OF BOVINE SPONGIFORM ENCEPHALOPATHY (BSE) IN CANADA. REPORT ON THE INVESTIGATION OF THE SIXTEENTH CASE OF BOVINE SPONGIFORM ENCEPHALOPATHY (BSE) IN CANADA.